I have a lot of friends. I have dog friends, horse friends, and people friends. I even tried to make friends with the snake that lives in the grass next to the barn, but he was afraid of me and wouldn’t stay and talk. I don’t speak snake anyway, so I guess it was just as well. My dog friends are a very diverse group. 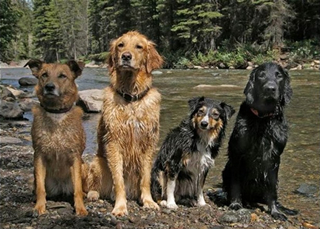 As a Golden Retriever, I’m the one who’s best at swimming and catching. Geoffrey is a fast runner and is the best wrestler. Scrugs has the loudest bark. One day, a mean dog came to the barn and threatened us. He was a nasty, beat up looking fellow with a chipped tooth and a big scar down his face. He snapped and snarled, and dared us to fight. He looked skinny and neglected, which just made him look scarier. No one knew where he came from and we were all a bit put off. My friends and I stood our ground together and growled at him to go away and leave our territory. He knew he was outnumbered and did not attack, but he refused to leave. I was growling and posturing when I noticed a deep sadness in this fellow’s eyes. I realized his aggression was a result of being in pain and in fear. I stopped snarling and took a chance that he was not what he appeared to be. I carefully approached him, asking if he would like to be part of our little pack. He didn’t know what to do at first, not sure if he was safe. But, he eventually dropped his head and said yes, he would very much like to join in our play. We let him hang out with us for the rest of the day. He was so happy to have new friends! Do you know of someone who appears to be mean or uncomfortable to be around? Maybe they are good people, but are simply in pain. Sometimes people like this just need a friend to reach out and let them know they are not alone in the world. They need to know someone cares. Are you the kind of person who could be a support to a fellow who is in a bad way and acting out? Do YOU need someone to help support you? We’re all in this life together. If we can be a help to our fellow beings, or allow others to help us when we need a hand, it makes the whole world a better place. There is good in everyone, if you look for it. Of course it takes willingness on both sides. Keep your boundaries intact, but don’t be afraid to give someone a chance. You may be as surprised as I was to have a new friend.